To get an idea of the dramatic impact you can achieve with mature plants, think about the impressive designs of display gardens at popular flower shows. Big plants create an effect you’d normally have to wait years to achieve, but many people have no time to garden or don’t want to grow everything from scratch. 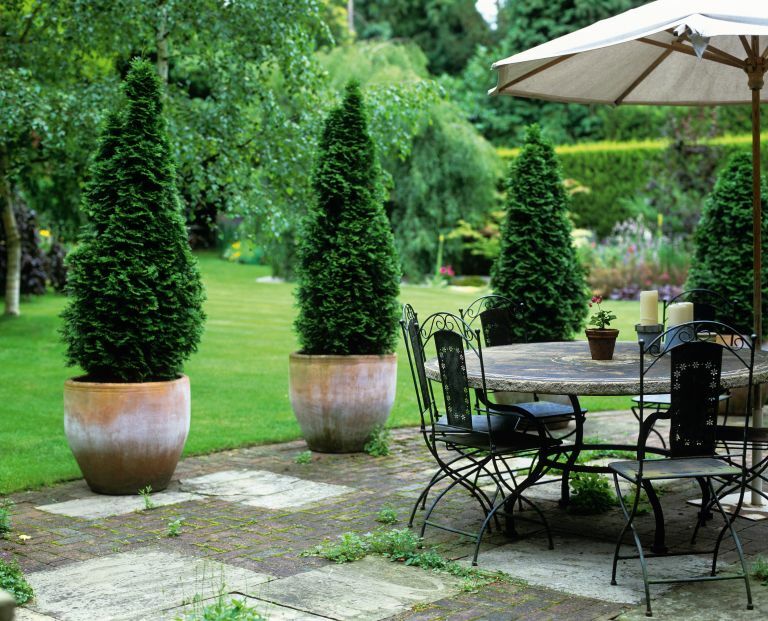 Large plants can make an empty space feel like an established Eden, and they’re fantastic for providing statement focal points, for screening unattractive eyesores, and for creating shade and improving privacy in your garden. Follow Matt James's tips for helping mature plants thrive – and making your garden fabulous. Then, find out how to plan, design and cost your garden transformation in our comprehensive guide. The most popular use of big plants is probably for providing privacy in a garden. Tall clump-forming bamboo such as Chilean bamboo and evergreen trees are most useful; sometimes just one is enough to screen neighbouring windows overlooking your space. For larger gardens, the cider gum and holm oak should fit, the latter responding well to pruning. In small gardens try bull bay, snow gum and the strawberry tree. Pleached trees, or ‘hedges on stilts’, are particularly useful and can be planted relatively close to garden boundaries. Beech, lime, hornbeam and evergreen holm oak are the most commonly available. Use our guide to creating a vertical garden for more on screening. Which plants can you buy big? It is possible to buy a mature plant of almost anything you can think of, but it’s not necessary to buy everything big. Large trees, evergreen shrubs, conifers, palms, hedging and huge bamboos should be first choice, as well as tree ferns and topiary; all are relatively slow-growing and important structural plants. Don’t waste money on huge herbaceous perennials, ferns or ornamental grasses, unless instant impact is key. Small plants establish more readily, bulking up to sizeable specimens in one or two seasons. Avoid huge climbers, except those trained on trellis or in broad flat fan shapes. Again, smaller plants grow fast. Nowadays, many garden centres sell big plants, but the markup is high, so do shop around. If you’re buying more than one or two, a nursery specialising in large specimens is your best bet – they’ll carry a much bigger range, offer good advice on what’s suitable for your site, and aftercare. Specialist suppliers will also offer a delivery service, unloading larger plants with a forklift or Hiab crane, the price depending on the number ordered. This is almost always a better option than trying to cram plants into the car or poking them out of the sunroof, where strong winds can cause irreparable damage. If you can’t visit the nursery, some specialists will also send you photos of the plants together with a price list. However, for choice one-off specimens, I prefer to pick the plants myself. Many semi-mature plants are field-grown, then lifted over winter and sold bare-root or as root balls wrapped with hessian and, sometimes, wire mesh. By far the easiest to manage, though, are container plants. Many specialists import and grow on container plants from UK wholesalers, but a large number come from warm climates, such as Italy, France and New Zealand. UK nurseries pick the best before having them shipped over, usually in spring, or cherry-pick European growers for giants tailored for specific customers. Most imported plants have been acclimatised before you buy them, but always double-check the provenance of what you’re buying, and particularly how long it’s been in the country – you don’t want to buy something that’s going to struggle to survive its first winter. How much do big plants cost? Price depends on many factors, including size, origin and maturity, although most are usually priced according to height, spread and size of container in litres. With trees, the trunk’s girth is also important. Most large shrubs come in 10-50-litre containers (a builders’ bucket is 15 litres) and can be easily handled by two people. Larger specimen shrubs and trees range from 50 to 100 litres; the biggest come in pots the size of a small car (with matching price tag). As a guide, standard shrubs, such as Osmanthus, Viburnum tinus, and Elaeagnus, with a height and spread of a metre, cost around £45-£50. A 40-45cm-wide box ball (in a 12-15-litre pot) will cost around £55. A two-metre-high black bamboo in a 15-20-litre pot is £50-£90. Expect to pay around £175 for a specimen three-metre-tall Himalayan birch with a 10-12cm girth in a 35-40-litre pot. Instant hedging is becoming increasingly popular, and, depending on the species and container size, can cost much the same as a standard feather-edge fence erected by a landscape contractor. For example, a one-metre-long, 1.4-1.5m high western red cedar ‘instant’ hedge (minimum order three units) costs £179.99 at Hedges Direct. Mature plants in pots larger than a big builders’ bucket are heavy and tricky to handle. Always check that you can get them into your garden before buying. Measure passageways and be mindful if you have to go through the house, as standard doorways are only 76cm wide. When you visit the nursery, measure the width of the container and canopy spread to check they will fit. With huge plants (in 300-500-litre pots) you might need a crane (from £300, depending on how long you’ll need it) to drop plants into position – a cost that’s prohibitively expensive unless you’re buying a large number of them. As a guide, plants in a 130-litre pot (with a 68cm diameter) are the maximum size you can manoeuvre through a standard doorway, although also consider the height and spread. Mature plants need more care than younger ones, starting with the planting. Measure the width and depth of the container and prepare the planting hole, ideally double the size, but no deeper (the aim being to cover the top of the root ball with no more than 3-4mm of soil). Spike the bottom of the hole, but don’t dig deeply as the soil underneath will sink, and the plant with it. Remove any netting and ties around the branches and look at the plant’s shape to help orientate it ‘best face forward’. Next, carefully lay the plant on its side and remove the pot, before teasing out the roots; this encourages them to grow out into their new home. Now gently lower the root ball into the hole, perhaps using a tarpaulin as a sling to take the weight (one person at each corner) to avoid damage. Lastly, backfill with compost-enriched soil, firming halfway up, before filling to the top and firming again. With all large trees – especially those in exposed spots – support with a double stake with cross bar, guy lines or an underground anchor. With really big specimens, specialist nurseries generally offer a planting service, which you have to pay for, but it’s good for peace of mind, and most offer a guarantee. Large plants don’t establish as readily as smaller ones, and with big trees it can take three to five years. Drought is the most common cause of plant death, so be sure to water well in dry spells. Slow-release drip irrigation systems and watering bags such as a Treegator are useful. Keep weeds down, too, as these will compete with plants – a 10cm-thick layer of mulch will help. If planting a lawn, keep a 1.2m-wide grass-free circle around the trunk. If planting shrubs as a windbreak in exposed spots, then a temporary windbreak of fabric netting, supported with strong stakes, is necessary for the first few years.